Benz’s big seven-seat SUV gets a new engine for its mid-range GL 450 model, which trades a turbocharged V8 for a turbo V6 with an identical 362 hp rating, but with 369 lb-ft of torque instead of 406. 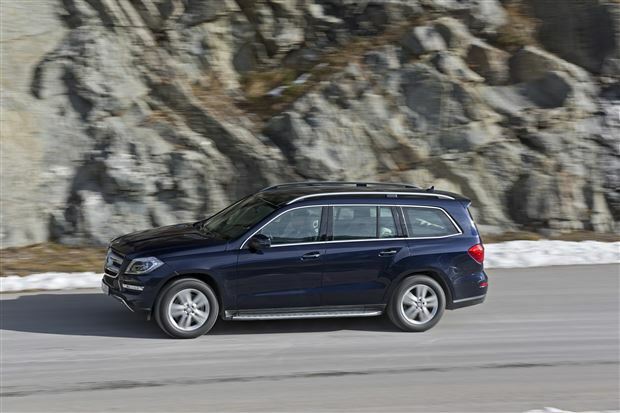 Otherwise, powertrains remain the same: GL 350 Bluetec trim gets a 3.0L turbodiesel V6 making 240 hp and 455 lb-ft, GL 550 models stick with a 4.6L turbo V8 good for 429 hp and 516 lb-ft, and the GL 63 AMG uses a 5.5L turbo V8 capable of 550 hp and 560 lb-ft. All come standard with Benz’s 4MATIC all-wheel drive system and a seven-speed automatic transmission. GL 350 and GL 450 models share much of the same standard kit, which includes electric power steering, air suspension, steerable bi-xenon headlights, dual-zone automatic climate control, LED daytime running lights and taillights, garage door opener, heated steering wheel, ambient lighting with three colour settings, artico leather-trimmed dash and seats, power-adjustable front seats with memory, Comand online navigation and MB apps, satellite radio, sunroof, power-folding third-row seats, 20-inch wheels, illuminated door sills, power tailgate, attention assist, crosswind assist, pre-safe, collision prevention assist, adaptive highbeam assist, parktronic with active parking assist, and a parking package that includes a 360-degree camera. GL 550 models add an adaptive damping function for the air suspension, AMG styling package, four-zone automatic climate control, keyless go, leather-trimmed seats, 14-speaker stereo, power pop-out third-row windows, multicontour front seats with massage function, climate confort front seats, heated rear seats, soft-close doors and tailgate, 21-inch wheels, and illuminated running boards. GL 63 AMG trim includes sport suspension, active curve system, unique 21-inch AMG wheels, Nappa leather upholstery, panoramic sunroof, and red brake calipers.